This is the second of a five-part series about the “stages” of personal finance. Last Sunday, I shared part one: “Fumbling in the Dark”. In June of 2004, Kris and I bought a new house. On paper, we could afford the upgrade. In reality, things felt pinched. For one thing, my consumer debt had grown to over $35,000. The increased housing payments didn't help. But the straw that broke the camel's back was the extensive remodeling ahead of us. I have a vivid memory of sitting in the corner of a buffet restaurant, eating lukewarm lasagna while scribbling numbers on a napkin with Kris. We were trying to calculate how much we could afford to spend on the house. No matter how we ran the numbers, we had $10,000 in projects we wanted to complete when we moved in, and an expensive bathroom upgrade the following year. I felt sick. Where could I find money like that? I didn't have any savings. The only paths I could see led further into debt. I could foresee owing $50,000 by the autumn of 2005. I was no longer merely fumbling in the dark — I had fallen, and I didn't know how to pick myself up. Soon after we moved into the new house, I complained about my financial situation to my friend Mistie. She listened patiently, and then she loaned me a book: Dave Ramsey's The Total Money Makeover. Dave Ramsey changed my life. The book was filled with stories of other people — regular people, just like me! — who had managed to overcome debt on average incomes. It was inspiring. “What have I got to lose?” I thought, so I implemented his debt snowball. As I worked to repay my debt, I read a book another friend had given me: Your Money or Your Life by Joe Dominguez and Vicki Robin. This book also changed my relationship with money. It helped me to understand that when I spent money on comic books or videogames, I was literally trading time (or “life energy”) for Stuff. If I could reduce my spending on Stuff, I could have more time to do the things I wanted. By sharing these books with me, my friends had provided a glimmer of light. I was still surrounded by darkness, but now I had a candle to guide my way. I was learning skills necessary to defeat debt and to build wealth. I had entered the first stage of money management. I learned to cut back on things I once thought essential. I paid down my debt, tentatively at first, but more aggressively as I gained confidence. I developed the strength to resist impulse purchases and to conquer compulsive spending. I began to save. Again, I started slowly at first, with just a couple of hundred dollars in the bank. And sometimes I would tap this for non-emergencies. By the end of the “first stage”, I had $1000 in savings, and I haven't touched the money since. I discovered the lively art of frugal living. And, most importantly, I began to think about my goals. Why did I want to earn money? What was I going to do with it? A huge part of this first stage was learning to live with mistakes. It used to be that when I did something dumb with money, I let that mistake derail me. I'd give up. I'd feel bad for spending money on something, but my solution was just to spend more money. Obviously, it is best to avoid these sorts of mental lapses, but it's also important to be able to just move on, to vow to do better next time. The first stage of money management is like learning to ride a bike. You fall down a few times, and you're often unbalanced and clumsy. It'd during this first stage that you need the most support. You're learning how to do this on our own. In later stages these skills will become habits, but at the start they take focus and energy. They take work. For me, the first stage of personal finance definitely felt like work. Hard work. But it was rewarding. Once I discovered that I had the power to control my personal finances, my attitude changed. Saving no longer seemed like a chore, but a reward. Repaying my debt was a slog, but it was a burden I was willing to bear. And the process of learning about money was fascinating, like discovering a whole new world. In my mind, I was in the zeroth stage of personal finance until October 2004, when I first developed a plan to get out of debt. I was in the first stage of personal finance from then until my non-mortgage debt was eliminated in December of 2007. What about you? Have you always had a good relationship with money? Or did you have a turning point like I did? How difficult was it for you to master the basic skills? At what point did you feel like you were leaving the first stage of personal finance? When your debt was repaid? When you had ample savings? Are there other skills you found useful during this period? What advice would you offer others who are struggling through these things today? There are 46 reader responses to "Implementing the Debt Snowball: A Personal Journey". I too had a wake-up moment after reading “Total Money Makeover”. I didn’t really know how to manage money. My husband and I were making pretty good money, but could NEVER save…something always came up. We read Total Money Makeover in January 2005..we implemented the plan by May 2005 and we were debt free (except for the house)in November 2008. Growing up my family really did not have much money so I guess I was forced to live as frugal as possible…however, once I started pulling in some money, there was a phase where I wanted and bought everything. It was not until the bills started coming where I realized I was heading down a very dark path. This was what pulled me back to being more financially responsible. I learned to treat my money like workers and kept a ledger to track their movements. I also become more of an active investor and learned the markets so I could build more capital and prepare for further stages in my life (marriage/kids/retire/etc) rather than live constantly for the moment. My husband and I have been pretty responsible with money since we were married, vowing to quickly pay off what credit card debt we accumulated in college. We did that, but now we’ve been married almost 7 years and consistently carried other consumer debt like two auto loans and student loans. I recently discovered Dave Ramsey also and figured out if we buckled down we could pay off both car loans and student loans in 3 months! Geez why didn’t I do this before. I can’t wait to be debt free except our mortgage which we now want to pay off in 10 years instead of 30. I’m now finding the hardest part is dealing with my family who are still in the dark and won’t take any of the candles I’m offering to light for them. Any tips on learning patience or letting go??? Yes, it takes a lot of terror-awareness to face one’s fate. It’s like I had to realize I was facing the terror of my reality before I was able to accept that things were bad and getting worse, and if I didn’t do something drastic, I was going to crash. Like an addict who finally wakes up and says to himself: I need drug treatment or I will die. My advice to friends is to tough it out for the period of time when you are paying off debt. The best motivation is having something planned, whether it be a vacation or time off from work. Either way the point is to have a reward for getting yourself out of debt. I know it may seem counter productive to spend money but sometimes financial decisions may be mentally dificult in the sense that you may lose hope. By having something to look forward to it makes the struggle a bit easier. I sat down with a friend who is struggling with money two weeks ago. He’s working a regular job and wants to put some savings away for a new home and a vacation next year. When we went through his expenses/income he was really shocked. For instance he realized that he spends $300 on coffee and $150 on cigarettes each month!!! That woke him up. He immediately cut back on smoking and instantly cut back his coffee drinking. He now prepares his coffee at home. He made these changes immediately. I was really happy to help my friend out – he’s been struggling for quite a while. I’ve known him for over a decade. I was happy to see him make the transition – not everyone wants to take personal responsibility for their own finances. At least now he’s aware of how his habits have affected his finances and what he can do to take responsibility. That’s awesome. I think many of us would like to know how you approached the conversation with your friend. Did he ask you for advice? Did you offer it? How did this work? Did you actually use receipts? Or did you just ask him to estimate his spending? Had a similar experience a few weeks ago with a girlfriend who is desperately in debt, and given that she can no longer use her house as an ATM she is finally being forced to pay the piper. In her case, she doesn’t have to give up coffee or cigarettes, but in my opinion move into a much cheaper house…I offered my opinion, but still feel she doesn’t ‘get it’…I feel like I am watching a slow motion train wreck–is there anything to do other than ‘let it go?’…I am probably more stressed about her finances now that I’ve seen her numbers than she is! This story sounds as if it could have been written by me. I didn’t accumulate as much debt, but I reached a breaking point where I didn’t know how I was going to make ends meet or afford to do the things that I wanted to do. I found Dave Ramsey’s Total Money Makeover and it too changed my outlook on my relationship with money and debt. Since reading that book I’ve paid off my credit card debt and am now focusing on eliminating my car loan. After that all that is left are my student loans. I believe I have always been good with money. Any debt that I did take on like college loans I quickly paid off. I have also been able to keep an emergency fund at 6 months and invest for retirement. Then I got married. The challenge here was to keep “spending” under control. A “budget” just did not work for my wife. I would set the “budget” based on our past spending and our income and ask my wife to help stay within “budget”. It was just to easy to lose control month after month and spend too much. My first step was to get my wife to be a participant. Just talking about a “budget” did not work for her. I selected books written by women for her to read. She did read these and she finally got the message. However, I had to change my approach as well. She now is the controller of our “spending” and paying off debt. Notice I said “spending” not “budget”. This was one of my learnings. My wife does better when she is controlling “spending” and not a “budget”. She knows the topic of “spending” very well. Although she never saw the responsibility of handling our money as a positive in the past, she has realized the freedom this responsibility has given her by being in control of our “spending” and paying off the debt. There are still some steps that we will need to take to be fully on the same page. She and I are taking these steps. I believe once we are true partners with regards to our money we are that much closer of be financially free. I’m really looking forward to reading more about the post-debt-repayment stages. Its hard to have money problems when you have no money. But now i have my first [good] job, been at it for the last 1 year. I don’t make much but having to pay for my college keeps my spending lean. However , since i’ll be graduating soon and hopefully getting a good job I hope to use experiences such as yours to chart a sane financial future. I want to thank you for your blog. I am a 30 year old male and have been subscribed to your rss feed for 2 months now. Reading your posts and the readers comments I have managed to reduce my debts, save more, and set savings goals. My fiance and I moved halfway across the country last year so that she could attend grad school. Because I am the only income for the two of us, we have had to rethink how we spend our money. eating out less, using public transportation, and reducing our wine drinking has made a profound impact on our expenses. Living frugally is now a habit for both of us and we are happy as we ever have been. I look forward to reading GRS every day. Thanks again. This subject resonates with me due to my current debt snowball. I waited 3 months for Ramsey’s book to come into our library and already had cut back immensly. I just gotta stay on track. It is hard sometimes to keep looking at that number on the wall of what I owe, however I keep chugging along. It just takes time and will power…. I’m 38 years old and like to think I’ve always been pretty good with money. I was about $30,000 in debt when I graduated from college, but I quickly paid that off. I’ve never carried credit card debt. But my confidence has waned of late. As for my investments, I’ve always kept around 70% in stocks. That’s the standard advice, but now I wonder if I’ve been greedy for “growth”. Obviously my portfolio has taken a big hit in this market. Maybe I should have kept 30% in stocks and just secured the remainder with cd’s and money market accounts. Are stock investments good financial planning or just a need for more? I’m starting to wonder. I’m afraid I didn’t have a wake-up moment, and might have done better if I had. Instead the last few years I went from, “No problem, I could pay off this debt in three months if I really needed to,” to, “in six months if I really needed to,” to now where it will be somewhere between six months and a year. Along the way there were multiple times that could have been a wake up call. From taking the car into the shop and wondering if I would have enough cash or even available credit to pay for the repair work, to having to turn down travel opportunities because I wouldn’t be able to afford the trips even on available credit. Fortunately I have become hooked on some blogs like this one which have kept the subject in my head. My progress so far has been small and slow, but at least it has now been better than treading water. After months of toying with the idea, I finally took the Dave Ramsey total money makeover class through my church, and that was the turning point. I remember reading the whole book in a week or two and finally owning the fact I was wrecking my financial future with my behavior. I tightend my belt, cut up my credit cards, got some help for some of my behavior through CODA and counseling and started aggressively paying off debt. 2 years later, I have payed off over 35K of debt, I have an emergency fund, and really try to live the mantra “save first, spend last”. This journey of financial recovery has shown me I actually am finding a sense of happiness and empowerment living on ‘less’. Instead of focusing on the stuff I want, I try hard to focus on what I HAVE and ENJOY it. I have so much! Health, family, friends, pets, etc. I’ve notice that these things bring more pleasure to my life than shopping for new stuff. Keep thinking on paper JD. I like where you’re going with this month’s Sunday topic. I’d like to know, can you describe what you think it will feel like, be like, when you have a ‘healthy relationship with money’? I’m not there yet, you mentioned you’re not there yet, and I’m curious, what defines a healthy money relationship for you? Anyone else have any thoughts on that? Also, to anyone starting out: From my experience, If you fear the idea of looking at your finances, that’s the surest sign that you need too! Take a deep breath, and a little action. As Nike says “Just do it!” The results can only be positive in the long run! I was in the zeroth stage of personal finance from the time I landed my first job in 1988 until I wanted to change jobs in 1999. I bought my first house in 1990 & that’s when things started to get out of control – I wanted to buy things for the house and continue to spend money as I had grown used to. My turning point came when I wanted to change jobs. I found that my financial situation would not allow me the freedom to do that. I had to keep my job with a predictable paycheck. At that time, God showed me the verse, Galatians 5:13, that speaks about our freedom in Jesus. Jesus died to set me free from the power & punishment of sin, but also from other things. One of those things I was not free from was debt. I was also not free to be flexible with my job. I was a slave to the lender (Proverbs 22:7). At that point my debt was about $25,000 – not including the mortgage. I began to work on getting out of debt. Yes, like you, it was very difficult, burdensome, and my friends and sisters gave me a hard time about my frugal choices. I had reduced my debt enough in 2001 to change jobs, but it took me until Feb. 2005 to get out of debt. I then had to start saving. It was at this point I married a man who didn’t have any debt, but he didn’t really have any savings. We both made mandatory contributions to pensions at work for retirement, though. During the years from 2005 through the summer of 2008 we were determined through the grace of God to stay out of debt and to save an emergency fund of 6 months of expenses. During this time we also purchased & paid off his car and paid off my car which was purchased in 2003. We finally accomplished our goal! This year we payed off our home. We have felt such an odd relief. It really feels good to have no debt, but it’s also a place that neither of us have ever experienced since moving out of our parents’ houses. We credit God’s grace with changing our attitudes about money, our needs & wants. I started reading your blog about 4 months ago. During the last month or so, we got to the same point as you asking, “what now?” We have seriously started giving more and thinking about retirement. It’ll be interesting to see where God leads now that we have no debt. I have cycled through stage 1 and stage 2 for my whole adult life. I was married young and got a decent job right away. My husband and I went through a couple of short cycles of accumulating debt (mostly related to finishing school and building a life) and accumulating savings. In the nearly 11 years we’ve been married we seem to jump between just making it and having several months of income in savings. We have small amounts of non-mortgage debt, but we could use an adjustment in our mind-set. We get to a good place and then begin to spend…until we have some debt then we freak out and are back to super frugal savings mode. We are saving now and would like this to become a pattern instead of lapsing back into spending mode. Any suggestions? Last little issue – we have three small children so each time we gain more income we seem to gain expenses too. Thank you for this very informative post. I would also add Brent Kessel’s book “It’s Not About The Money.” This book greatly helped me recognize the reasons I had accumulated a lot of consumer debt and how to get rid of it. I just finished paying off the last of my credit card debt and I am excited about taking the money I spent on that and putting it into savings. I never made savings a priority and I spent everything. It took a lot of things to make me decide to change and I would pay off debt then immediately reward myself by spending. I think now I might finally have practiced enough to be able to get it right. The problem is that spending is addictive and growing up poor and learning nothing about how to be responsible with money. I have only read online tips about the debt snowball and how others paid things off before I decided to stop paying other people and pay myself. I am looking forward to learning about what to do with the money I save after I get my emergency fund squared away. If this economy is a wake-up call for people there will be many others wanting to learn, too. I started my first full-time office job after college in January ’08. I was making more money than I ever had before, and I spent it like crazy. I ate out for lunch every single day. I played $1/$2 No Limit Hold ‘Em every weekend, and some months I would blow through $750 or more on just poker. Thankfully I never accumulated an iota of credit card debt. That was something drilled into me from a very young age; credit cards are poison. I paid my CC bill in full every month. Come June, I went to my first work conference in Las Vegas. Oh boy. I spent over $1000 in four days there. I knew it was too much. It was insane. The real shocker came when I checked my checking account balance at the ATM… $7. I had just $7 to my name. Now, I knew I was getting my paycheck the very next day, but even that knowledge didn’t cushion the punch to the guts that the ATM screen offered. I’m happy to say I turned my situation around. This coming week, I’ll top the $5,000 benchmark in my savings account. Still no credit card debt. I’ve doubled and tripled my monthly student loan payments. I contribute enough for my full employer-match in my 401k. I’m 23, and I’m on my way to financial independence. i graduated in may 2007 with over $90K in student loans. my wake-up call came when i first started working and realized how much of my pay cheque would have to go towards debt repayment. as of today’s date, my debt is down to $60K. i have an aggressive plan for tackling the remaining debt in the next 24 months. i’ve also started an emergency savings account and set up my retirement fund. i can’t wait for the day when my money will truly be my own! thanks JD for this blog. it serves as a constant source of encouragement. JD, I too have been following your blog for about 2 months now. I stmbled upon it reading the buying a house versus renting a house post. Since then, I check your blog every so often. My wake-up call came last year just before my divorce of my husband of 10 years. He was very controlling over money matters and although our salaries went into a joint account, he was always in charge – and I let it be so for most of my adult life. He was in charge of every step we took in life, and there were many, houses, cars, we moved between cities and countries so often. We met when I was 19. Now I’m 33. I have good job, but I had to get rid of so much debt in the past year. I sold the house, both cars, and sorted monthly expenses out for the first time. I woke up! For years I left all money matters to him and he always assured me we are doing fine but actually, looking back, we lived on debt even though our monthly income was good. When he left, the money situation hit just as hard as the break-up emotionally was. 2008 was hell! Reading your blog made me realise I’m not the only one who have been ignorant of my own finances in former years… Many of us get this wake-up call in our 30’s and many different things trigger it. Mine came overnight and change me overnight. All I can say is, no matter how hard the last year was, and even though my living standard came down quite sharply, I am thankful for the day the wake-up call came into my life. And I’m glad it happened to me last year, and not in another 10 or 20 years time from now!! We haven’t found a way to enlighten those that are in the dark either. My husband and I have been married 23 years and have no debt. It’s easier for some family members to call us lucky and cheap than to consider we may have some wisdom to share with them. They have the right to their opinion, and as long as they don’t expect us to rescue them from their financial mistakes, I just mind my own business. My turning point came in the months after I got married, when my husband and I started combining our finances. I knew my husband had student loans and other debt, but it wasn’t until I added it all up that I realized we were $37,000+ in debt and had no savings or retirement accounts. That’s when I hit the first stage. I read tons of pf blogs (GRS is my favorite! ), books including The Total Money Makeover, Your Money or Your Life, and A Random Walk Down Wall Street, and we started paying down our debt. Even still, this second stage of putting what we learned into practice has taken a year and a half so far. It was a year before we started tracking our spending and opened a Roth IRA. By July the $37,000 should be paid off, and I think then we’ll be entering the third stage. I’m already wondering what direction our money should take when we’re debt free, such as, How much should we contribute to our retirement accounts? How will having kids affect our finances? How much should we put in the car replacement fund? Should we start saving for a house, even though it might be 10 years before we buy? Just like you said JD, there certainly is a point to saving, but what is it? My advice for married couples in this stage is that if you want your partner to do something, you have to do it first. I remember trying to impose a budget on my husband – how condescending of me! Of course it didn’t work. Later, I started tracking my own spending and just totaling up what he spent. I did this for several months, and when I showed it to him he realized that he actually spent a lot more than he thought he did. After that, he started giving me his receipts and we track our spending together. It’s not something I made him do; it’s something we do as a team. He would never have done that if I hadn’t first. I cannot give any advice because i need advices. I don’t know how to manage my money, I have debts and i can’t save not even a little bit. It’s really difficult to get to a point. I’m a Total Money Makeover convert too. We’re in the early stages but we’ve definitely turned the corner. I’m enjoying this series so far. Unpolished posts are refreshing sometimes :-) Thanks! I never really had a wake-up call or turning point as I’ve never really been in debt but there was a moment about 9 months ago when I realised that, even though I scraped by each month, managed to save for short term goals easily and had some longer term savings, I didn’t really have control of my own money. Using credit cards (not beyond by means/income) meant I was always playing catch-up. I was spending money about a month before I was actually earning it. This sort of lifestyle is sustainable if you always continue to earn – but what if one day I stopped earning? The credit card bill would come but there would be no paycheck to take care of it. That was, I guess, my “turning point”. When I read your post it didn’t really occur to me but reading through the comments it kind of clicked- despite not “having debt” I was, as a credit card user, “in debt” and this is not a healthy financial position either. Ali’s comment @ 23 sums up how I felt (and stil at times feel as I still have some spending issues) – “I can’t wait for the day my money will become my own”. I really can’t imagine what it would feel like to receive a paycheck and not have outstanding bills that consume most of it. I have made progress in that I have a healthy emergency fund now and have about $15k saved towards a house. I pay myself first each paycheck but after that and paying rent/utilities sometimes all my discretionary money is already spent on my credit card and so to have any fun that month I pay off my cc and rack up more debt on it – its a vicious cycle. Although I continue to prioritise, reasonably succesfully, saving (40% of my income) I will really feel financially free when I know that whatever I get paid is all mine – and not the credit card company’s. I really appreciated your article. My husband and I are slowly paying off our debt. We just refinanced to a 5.5% 30 year fixed which frees up about $150 a month in payments that we can use towards other debt. And, I’ve been throwing any extra money towards paying off my car and I’m just 1 payment away…which will then free up an extra $300 a month that we can put towards debt. 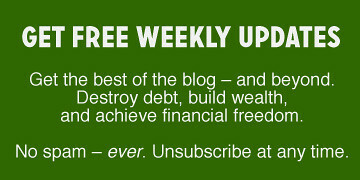 I love Dave Ramsey’s plan to pay off the smallest debt and then use that money to put towards the next smallest. I’m starting to get a taste of that and it is a great feeling. I’ve made some stupid financial mistakes, but thankfully nothing with terrible consequences. It’s a learning process. It isn’t always possible to get through to family. I am thankful for this aspect of the current financial mess: my BIL was laid off, and my husband finally agreed to set up a savings account for family bailouts. (He feels great responsibility for his family, and we are often asked to help out. ) Prior to this, he felt that budgeting that help was planning for his family’s failure. Now he’s come around to see it is just good sense to be prepared. And because the account is in his name only, it will prevent fights. He can take the money out as he feels necessary, without involving me. I just started reading your blog, and it’s very interesting. We really need to create a livable budget — I’ve never figured out how to do this properly, which means we can never follow it because it’s unrealistic. We have more debt that I want to admit to, and it stresses me out all the time. We have a dog, some fish, and two children small enough to need childcare, and the childcare alone is enough to put you over the edge. I’m ordering The Total Money Makeover from my library — but can it *really* help us get out of debt and create a realistic budget? We need to get there, soon! One year after this initial conversation, he asked me to sit down with him and review his finances. And we did it by estimating his income and expenses. It’s so funny because a couple of months after he started he noticed that he had $100 in his savings account. He was pretty excited because it was the first time he has ever had savings put aside. I often feel I’ve lucked into my money situation. I’m not rich by any stretch, but managed to stay debt free except for a house and have never had a credit card (I’m 30 now). I read Dave in college and practice some of that now (emergency fund, living ‘below means’, etc), but still feel like I’m not investing and saving quite right. I am in a similar boat as JD was a long time ago, here is a question that is haunting me now. I am a first time home buyer who is getting the $8000 credit from the recent stimulus. Should I use that to pay off on my credit card (3.99 apr) or should I put that into my mortgage (5.625 apr) principal that will partially eliminate the PMI I am paying? I got into this predicament after I started reading GRS regularly and realized what I got myself into by buying the house, although it is a great feeling to have my own house. And thank you JD for taking the initiative for writing these articles that is helping so many individuals navigate through the financial darkness. This is my first comment, but I’ve enjoyed reading your blog for the last year or so. The epiphany came after a casual conversation about college costs for my oldest son. It was like a bucket of ice water was dumped on my head. Soon after, my wife and I started paying down our debt by throwing every extra dollar at our credit card balances. It’s a great feeling when your credit card balance is zero. J.D., thanks as always for a great post. My first “candle in the dark” moment came when I read Your Money or Your Life. But I still couldn’t seem to get a grip until I found the budgeting program You Need a Budget (YNAB). That whole thing about giving every dollar a job to do (BEFORE you spend it!) really helps. Now I just started it less than a year ago, and I must admit that I messed up at Christmastime as I realized I had not saved enough for gifts. So I overspent that category, but like you said, one important thing is not to give up when you make a mistake. Don’t compound the problem by overspending more, just get back into the swing of things again. @New beginnings — you might want to put your stimulus check in a safe savings account so that if something comes up you can use that make sure you can keep paying your mortgage. If you apply this to the mortgage early, a payment will still come due every month. Paying down your credit card also won’t help, though paying off your credit card could free up money to go into savings. But then many people find that if they use a windfall to pay off a credit card, they charge it back up right away whereas if they find a little extra money each month, that hard work helps motivate them not to charge up the credit card. “I felt sick” .. is the perfect description and I love the fact you said it. It is usually in that moment of realization that we gain the most clarity on how screwed we are and how the $5 latte has gotten us no where and that there are are very few “Bill Gates” and a whole lot of “John/Jane Doe”. For me it was my first overdraft. I had always been a saver, but at one point it hit me that I could actually run out. This was in college shortly before getting a job. Since then I continue to fight the cursed lifestyle inflation. I’m 24. I rent a small one bedroom but am thinking of buying a house this year due to the depressed market and stimulus bonuses. I keep going, that could be nice, and then have to re-center myself remembering that I’m simply replacing not trading up. And of course the lenders, the agents, and the friends all say… you can afford it. It is a good thing sites like this keep reminding me to live with less and not get in over my head. I’d hate to have debt later just because I got tempted by a fancy kitchen and a big living room. Hi JD, first I want to say that I’ve been reading your blog for a few months now and it’s been a great inspiration. The moment of truth for me came when my boyfriend offered to pay off my credit card debt because it bothered him that I was getting reamed by interest payments he felt were unnecessary. I really balked at this concept because I hate being reliant on someone, so to assert my independence I determined to pay off all of my credit card debt in three months time. It was aggressive and I really had to pinch my pennies, but it worked, and by the time I was done paying it off I had such a feeling of satisfaction. Not only that, by then the credit crunch had gone into full swing so I was especially glad I had paid it off. Right now I’m working on building up my emergency fund and living a more frugal lifestyle so that I feel more in control of my finances and by extension, my life as a whole. Reading your blog has really helped me achieve quite a few of my financial goals. Thank you for all that you do! This is an excellent post and an excellent blog, JD. I just wanted to say that “payed” is spelled “paid.” I hope you don’t mind — every other aspect of your blog has so much real-life credibility that I didn’t want one thing to distract. No problem, Faculties! I welcome typo corrections. (Or spell-o corrections, as in this case.) I’ve actually had something of a lapse lately; my spelling has been atrocious. I’ve been a good speller since third grade, so I’m not sure why that skill is going now, but it is. Homonyms, especially, are giving me trouble. JD, just want to say I love your blog and have been reading for about a year now. Like some of the posters above me, I had money issues. However, mine are just the opposite of most people – I’m terrified to spend money. Since October of 2004, I have worked steadily. I left one job when their sales started to drop and the ‘lay off’ work was being whispered. I manage to find another job with a company that was doing great, but now even the economy is starting to effect them and I’m getting worried. Basically, I’m somewhat scared to spend money on things I enjoy. I’m afraid I’ll lose my job again and that will be it, 25+ years of work down the tube for nothing. I’d love to buy a house, but I’m afraid I’ll get layed off. I would feel like an idiot for spending 20k on a house downpayment when I could have kept that money in savings and lived off of it to tide me through. I have never had a real vacation my adult life because I’m afraid to ‘waste’ the money on something like that when I could actually use it to survive a jobless period. I try to be generous with my family, and I eat out a few times a month, and buy a few new clothes every few months, but thats about it. I really need some help. Anybody have a suggestion? I am the opposite of most people commenting on here. I have always been a saver and I have to attribute it to my parents. My dad was always responsible with money – living on 2/3 of what he earned and saving 1/3. He is a high school graduate and grew up poor. Yet, he put all three of his children through college and bought each a car at graduation. They are now retired with two homes. I either inherited his gene or learned from him because I have never been in debt and have been saving for retirement since my first job out of college. Of course, because my dad paid for my college I didn’t have that debt starting out. I hope to do the same for my kids to keep the cycle going. I’m similar to Michele. I grew up with this image of my dad being sad whenever bills came in. He has never been in debt and bought our house outright after saving for it in Japan and moving to England. He’s always made it clear that savings are not to be touched (although he never named it such it was our emergency fund). I have to thank him for my ability to save. A lot of mine and my sisters’ childhood was focussed on success in extra curricular activities and we rarely went shopping. He’d usually do it alone or my mother would do it alone and then there would be no need to expose the kids to it. My mother was a bit of a spendaholic during her first years of work but she soon learned that it’s not worth living paycheck to paycheck just to get more ‘stuff’. Since then she’s pretty frugal and has spent more time teaching me and my sisters about enjoying life. All of us took out a student loan because it always makes sense to do so in England. You can actually make money from it as the interest rates are low. I’m going to graduate with about 25 grand debt but I’m not worried. I’ve saved around 13 grand from working from the age of 13 and working during university. These websites have just reinforced the message that it is important to have control over your finances. I think people can lose perspective when they spend. They think it’s freedom when actually it’s trapping them either through debt or just bad habits. Me and my sisters are adults now and to help my father replace his car we always lend him money. I know this is a big no-no but we’re not lending it cos he needs it. We’re lending it so that he doesn’t have to touch his emergency fund and pay the car off in full. I’ve tracked my spending since the age of 16 after a breakup and haven’t looked back since. I love this website! JD is a master of the written word. Even though this series is supposed to be ‘unpolished’ I still think it is polished!